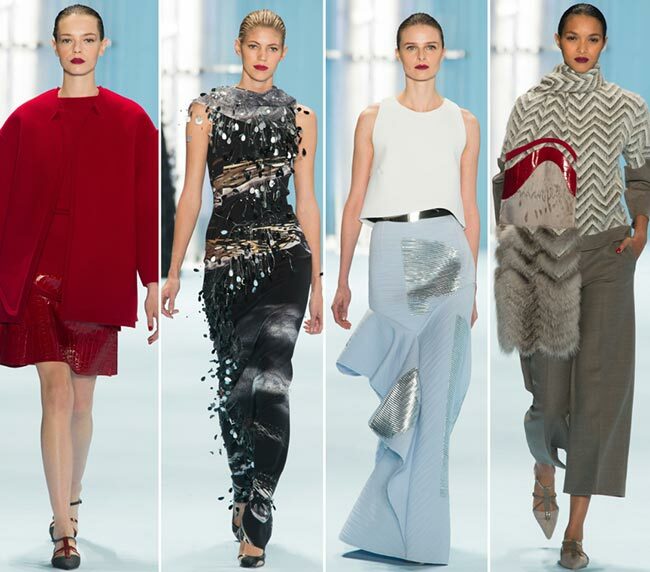 The spanking new Carolina Herrera fall/winter 2015-2016 collection sent out an array of marvelous water inspired dresses and separates at New York Fashion Week. 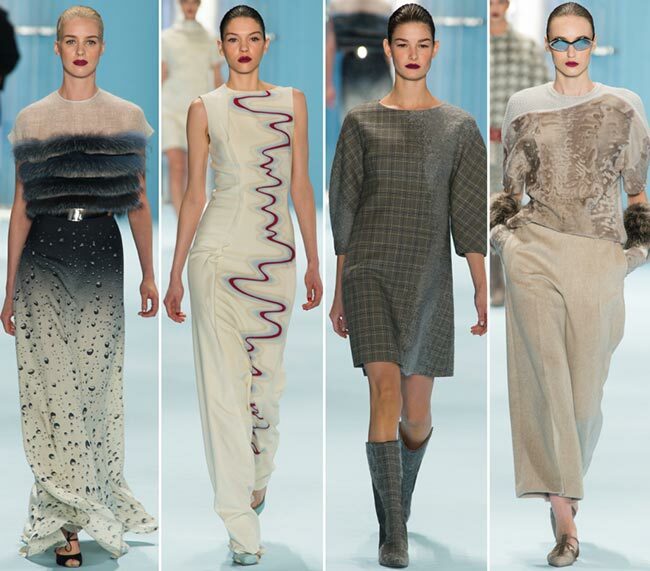 One could hardly present better interpretations of the water in terms of fashion design as the Venezuelan-American fashion designer did, making everyone’s jaws drop at the sight of those ethereal, feminine and elegant pieces. The backdrop of the runway was painted in blue to resemble water and the models walked down the runway in cozy and warm daywear separates and mesmerizing evening gowns in a limited palette of grays, blues, creams and blacks occasionally interrupted by splashes of red. 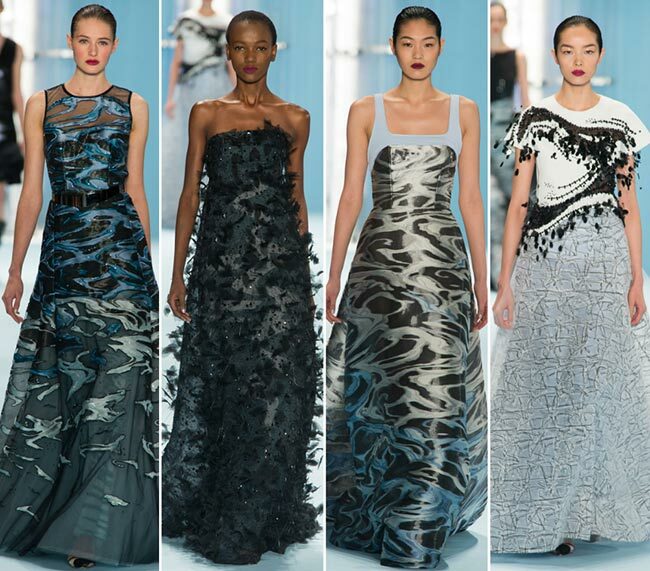 Water was present in every aspect of the designs showcased, both in the soothing color palette and in the ripple prints and the motifs of carbonated bubbles, but also in the flowing silhouettes and ruffles that injected a touch of lightness to the overall scene. There were lots of casual and cocktail dresses showcased, as well as evening gowns and elegant pants with matching tops and suits, perfect for work wear. 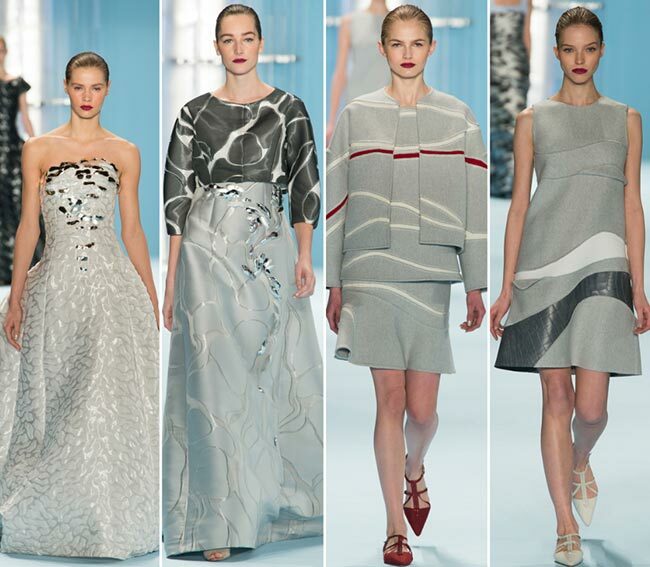 The interesting game of fabrics and textures is another characteristic feature of the entire line, which injected an innovative and modern touch to the designs, offering something new to the devoted Herrera clientele. Whatever the theme of the collection is and whichever season it is designed for, it has to be overly elegant and feminine, if we are dealing with Carolina Herrera creations. She knows what real women want and need to look gorgeous on every occasion and she manages to dress her customers according to the modern trends, while also always preserving the right attitude of classiness. 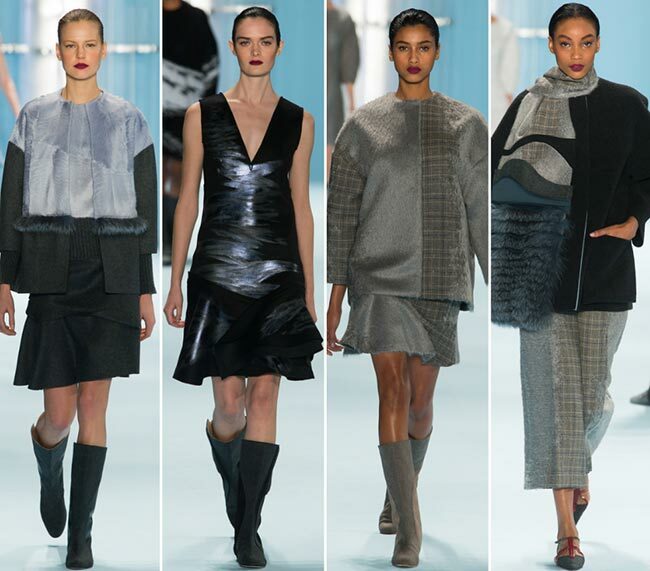 Her fall 2015 ready-to-wear collection as well manages to stay true to the style ideology of the luxury fashion house, skillfully combining the innovative with the classic, and the experimental with the timeless. Thus, feminine dresses become the focus of the entire line, coming in different lengths and shapes to satisfy everyone’s style needs. 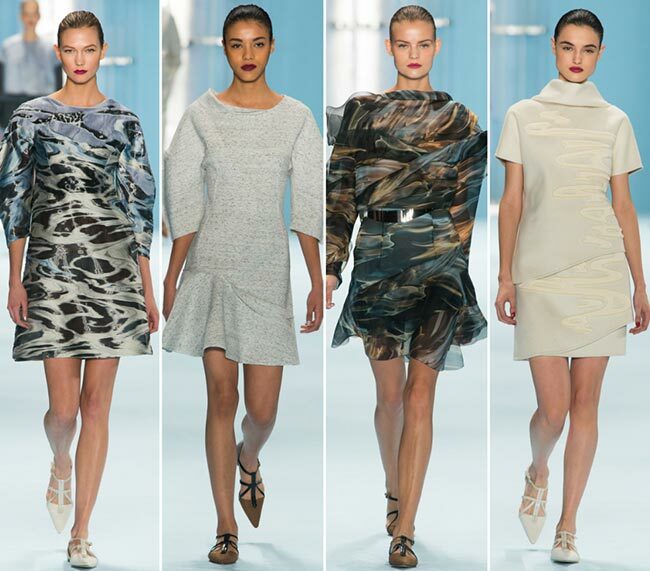 You have mini dresses with cocoon sleeves, just above-the-knee options and ground-skimming gowns for special occasions. Still, we could also see lots of pants designs as well, which were mostly cut at the tea length and featured wide legs, coming either monochrome or in a checkered print. Cream, rich red, black or gray, these culottes look extremely versatile perfect both for wearing to the office and for a night out when you are looking for chic alternatives to dresses. 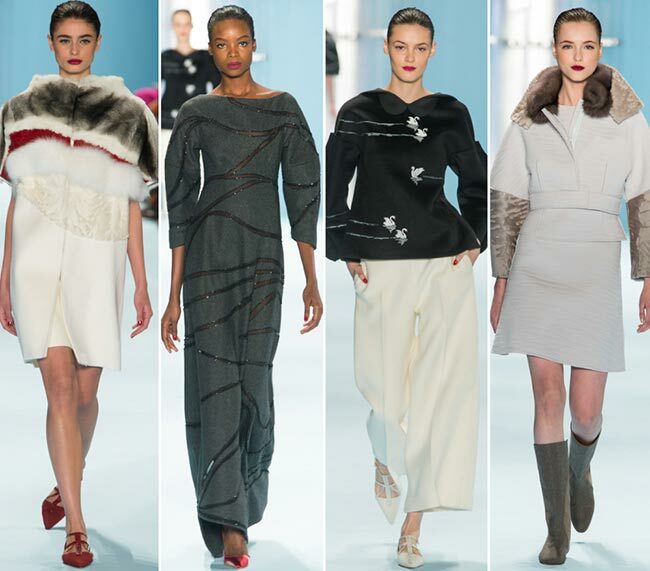 In addition, the Carolina Herrera fall/winter 2015-2016 collection offers some chic outerwear alternatives, which mostly feature oversized designs and cocoon sleeves to fit in with the mood of the entire fashion line. A fuzzy mohair sweater looked like an outerwear in itself, coming teamed with a flared mini skirt utilizing the same material and color. Quite often, the outerwear was styled the way to perfectly match the dress worn underneath, which is exactly the case of the black water printed coat that was topping a dress in the same color and pattern. If it was a monochrome red outfit, then a red coat was to finish that off, and if that was an abstract printed dress, it was to be worn with an oversized coat cut at the same length and featuring the same print. The footwear used to complete the looks came in a classic pointy toe design, but we also saw some flat fall-ready boots that injected a subtle casual touch to the elegant outfits. Other than that, a couple of outfits were also accessorized with futuristic sunglasses, while red lips and classic buns came to finalize every single look showcased. Wholly, the Carolina Herrera fall/winter 2015-2016 rtw collection looked fresh, lightweight, but extremely chic and elegant.